Acts 13:1-3 KJV Now there were in the church that was at Antioch certain prophets and teachers; as Barnabas, and Simeon that was called Niger, and Lucius of Cyrene, and Manaen, which had been brought up with Herod the tetrarch, and Saul. (2) As they ministered to the Lord, and fasted, the Holy Ghost said, Separate me Barnabas and Saul for the work whereunto I have called them. (3) And when they had fasted and prayed, and laid their hands on them, they sent them away. We have probably all heard of abuses of power in the church, one way or the other. In an “elder”-run or deacon-run church, they abuse the Pastor. Or in a Pastor-run church, he abuses the people. Almost all would agree that abuse is wrong. However, no matter how many cases on both sides are gathered, it does not negate God’s Word on how a church should be governed. If we do it the biblical way, then we have God’s blessing and anointing. Not to say that doing it God’s way prevents abuse because people are still involved. When a man is given authority, he can really mess it up…just look at Adam. So is it God’s intent to revoke the authority? No, God has never revoked authority but He will ultimately be the Judge when a man abuses power. The Bible is clear that the Pastor, also known as an Elder or Bishop (essentially the same words), is the highest authority in the local church. He is the one ordained and anointed by God to oversee the local church as proven in the previous articles on Biblical Church Government. It is not to be governed by a group, yet the Pastor would be wise to gather a group under him to help him make decisions. Laws often require that a church be run like a business having a minimum of three people on a board. Yet a church is not a business. Its purpose is not to gain profit, it is to preach the Gospel and grow believers. Therefore, we need to govern the church not according to secular laws but according to the Bible. However, we can still abide by secular laws while governing biblically. A church should set up a corporate board by whatever means the government requires. This will keep them tax-compliant and prevent issues with litigation. You certainly would rather have someone to sue the church corporation rather than you personally when something goes wrong in the church. Decisions solely concerning the church as a corporation should be handled by the board. However, seldom are such decisions necessary. The Pastor should be on the board as the Chairman with two other trusted people, ideally non-church-members who are experienced at governing churches – such as other pastors. That way local church politics will not impede the function of the board. The actual governing and oversight of a church in every other aspect should be done by a single Pastor. This pastor is the final say on all decisions concerning the church. He is the one that makes the decisions on how to spend all the money for the church. He is the visionary of the church. He is the one, the only one, that God will speak to concerning the direction of the church. If someone thinks they are hearing from God concerning going a different direction for the church other than that of the pastor’s, they are deceived. God does not tell one person the vision then whispers in the ear of someone else to go a different direction. God is not confused, nor the author of confusion (that would be the devil). Understanding this clear leadership of the pastor eliminates all division in the church…if only the congregation would accept it! Then the church would have one direction; if the vision is articulated well by the pastor, they can all be on one accord moving in the same direction. This type of biblical church government would allow the pastor, and the congregation, to quickly spot dissenters and those that would cause division. Then the pastor should confront them and ask them to line-up with the vision of the house or they should find another place to fellowship where they can agree. Does this mean Pastors are accountable to no one? No, we see a clear line of authority in the New Testament Church. The local Pastors of a city were submitted to a single Pastor over the whole city, like Timothy. Then Timothy was submitted to Paul. Paul was so much more everyone’ senior in spiritual calling, spiritual experience, and natural age that he had no man over him. He was able to govern at the highest level of the churches because he had founded so many of them. Today we have a completely different scenario when it comes to local church and their pastors. If a Pastor founds a church and hands it off to a local Pastor, then the line of authority is clear just like that of the Bible. The local Pastor is submitted to founding Pastor. But churches today are not like that in most cases. All the churches of a given city are not under one founder. 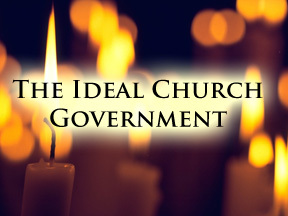 However, I believe we can still establish a pattern of local church government that exemplifies the principles of the early church, namely that of order and accountability. So what is the ideal way to keep the local Pastor accountable? By having someone over him, senior in ministry and calling, like Timothy who is submitted to someone senior over him like a Paul. This accountability has little or nothing to do with governing the local church but has to do with personal accountability. If the local Pastor should get into error doctrinally or have moral/ethical failures, then he needs someone over him to correct him. Ideally this would be some type of senior in ministry or a ministerial association of some kind delegating someone to be over him. Again, this person has nothing to do with overseeing the church – he oversees the Christian walk of the local Pastor so as not bring reproach to the name of Christ should the Pastor go astray. 1 Timothy 4:14 KJV Neglect not the gift that is in thee, which was given thee by prophecy, with the laying on of the hands of the presbytery. The presbytery were a group of Pastors that recognized the call on Timothy’s life and laid hands on him for ordination into full-time ministry. A senior group of Pastors (or a Pastor) who recognize someone’s call and ordains them should also be that person’s guide in ministry. This line of authority is clear in Scripture and would be ideal for the Body of Christ today if people would be humble enough to submit. This role of a senior in ministry and calling is often fulfilled by some type of ministerial association that has the power to revoke their ordination should one go astray. To effectively fulfill this role, the ministerial association should have someone intimately associated with the local Pastor so as to be able to see their Christian walk and speak into their life. Local Pastors that have not been in the ministry more than 25 years should yearn for someone to be over them, if they are humble and submitted, to keep them from going astray. The local Pastors of a city needed a Timothy. Timothy needed a Paul. If you are without a head, even though you may be a minister, you are on dangerous ground. You are open to attacks of the enemy that will lift you with pride, and destroy you when you make a mistake…and we all make mistakes. To have someone over you lets those under you to know you are humble, submitted, and accountable should anything go wrong. It prevents reproach against the name of Christ should you fall by allowing that senior to correct you and get you back on course in ministry instead being thrown to the wayside, unfit and unusable for God’s Kingdom again.